Condition : NEW Brand : Foster Electric. Above descriptions were translated by AutoTranslator. Unless noted otherwise, General notes for Japanese products are followings. Basically designed for Japanese domestic. It's possible that there might be damages on item box even if new item. We could receive bulk order, so we would appreciate if you could consult us! When repairing, unless manufacture in your country can deal with it, you might have to send the item to Japan. Therefore we cannot make a definite promise that manufacture branches of your country can accept repair. We would appreciate your understanding. We do our best to resolve your problem. The item "FOSTEX 16cm Cone Type Full-range Speaker Unit Bass Reflex FF165WK from Japan EMS" is in sale since Tuesday, April 3, 2018. 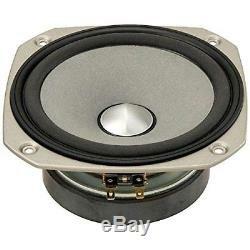 This item is in the category "Consumer Electronics\TV, Video & Home Audio\TV, Video & Audio Parts\Speaker Parts & Components\Speaker Building Components". The seller is "pena-shop-japan2" and is located in Chiba. This item can be shipped to United States, all countries in Europe, all countries in continental Asia, Canada, Australia.